A trade rumour and playing in his hometown of Philadelphia may have been the perfect medicine for Kyle Lowry. 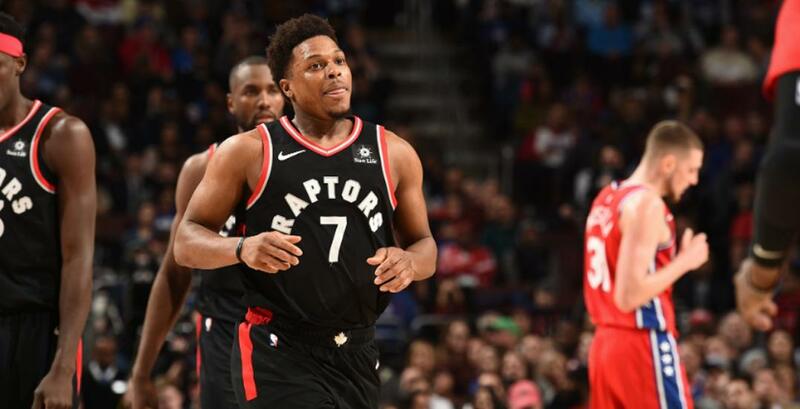 After sitting out one game for precautionary reasons surrounding his back, Lowry returned to the lineup to lead the Toronto Raptors to an impressive 119-107 road victory over the Philadelphia 76ers on Tuesday night. Reports over Lowry’s back issues had him listed as doubtful to play in the affair, but he looked perfectly fine – exploding for 17 points in the first 24 minutes of action. Lowry played in his typical ‘bulldog’ fashion, continually driving the lane while seeking out body-contact, and helping his team take a 72-55 lead at halftime. Toronto never looked back in the second half, coming up big defensively down the stretch and handing the 76ers only their sixth home court loss of the season. Lowry finished the game with 20 points, hitting 5/9 shots from three, while adding six assists and two steals. Lowry’s big performance also comes amidst his name being the subject of trade rumours with the NBA trade deadline approaching on February 7. Following the game, however, the Raptors point guard reiterated his commitment to winning with the Raptors. With the big win, Toronto improves to 39-16 on the season – good for second in the Eastern Conference. The victory also gave Raptors fans a glimpse into what this team can accomplished when its stars are at their best. Along with Lowry’s stellar play, Kawhi Leonard led all Raptors with 24 points and Serge Ibaka added 20 points and 10 rebounds. The Raptors will continue their current road trip on Thursday when they play the Atlanta Hawks.